One unfortunate (in our opinion) little boy actually drank some of it once, thinking it was apple juice. His face, as the vinegary fermented flavor hit his tastebuds, was priceless. Had youtube and flip videos existed back then, we would have had a viral moment on our hands. Fast forward a couple of decades. Suddenly, that self same sweet-sour funk has become an appealing, downright addictive, sensation. One that I will shell out my coffee money for, and which I would take over a sweet drink any day. Given this affinity for tangy drinks (not to mention my ever-growing fanaticism for pickles), when I first heard of drinking vinegar, I immediately went all googley eyed at the mere thought. I knew, with the faith of a zealot, that this would most certainly be a drink for me. 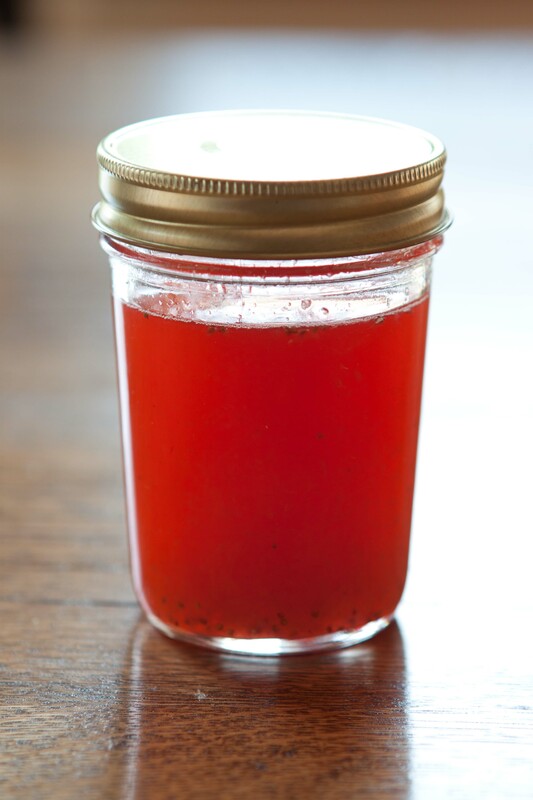 I stumbled across drinking vinegar a couple of weeks ago on the darling Oh Joy blog. (Apparently they are popular in parts of Asia, and as such an Asian restaurant in Portland, OR, both of which are culinary endorsements I trust) I was instantly smitten with the concept. Then, I learned from Emiko about something called an “acetosa” which she read about in the old cookbook writings of the renowned Italian Pellegrino Artusi. It sounded rather conceptually similar – sweet, fruit, vinegar all blended to make a refreshing base for a drink. I turned to the google to learn a bit more and I discovered “the shrub,” an old colonial drink that is essentially the exact same thing. You know what they say, third time’s a charm! After three different places, three different names, same drink, I was determined to have some. Plus, in each of these versions, the drink is touted as being not only refreshing but also having restorative health benefits. Sign me up! I was not, however, going to drop the money to mail order it from Portland. I was going to make it myself! Now, plain old drinking vinegar uses honey and vinegar while a shrub calls for infusing vinegar with fruit or berries and then adding sugar. Artusi’s acetosa calls for fruit liqueur. I chose to use a fruit puree and a sugar syrup (though next time, I think I’ll try honey) to add to the vinegar, mostly because infusing is all well and good, but I wanted to drink some actual fruit in the mix. Our strawberry plant has had an odd second wind, so it’s strawberry season again around here, but you could use most any kind of berry or fruit you’d like to puree and strain – raspberries, blackberries, blueberries, black currants (oh. yum. 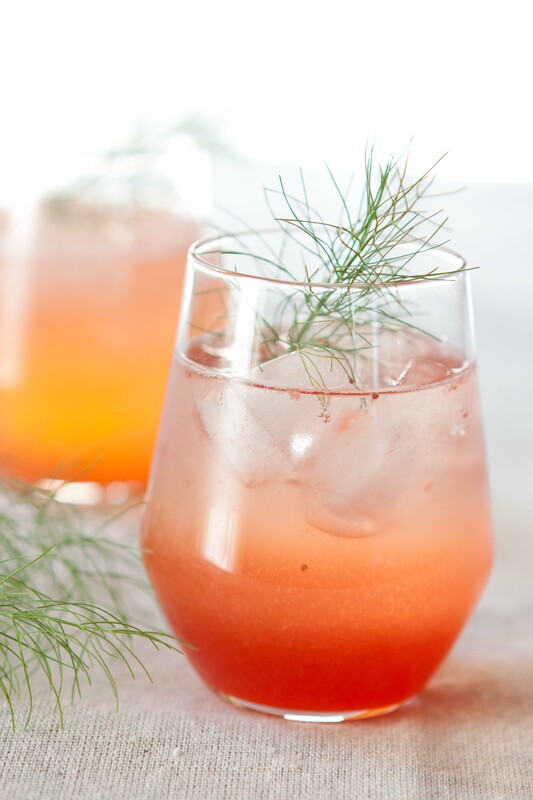 I adore black currant juice), mango, pineapple, and then you could add herbs… Endless possibilities! 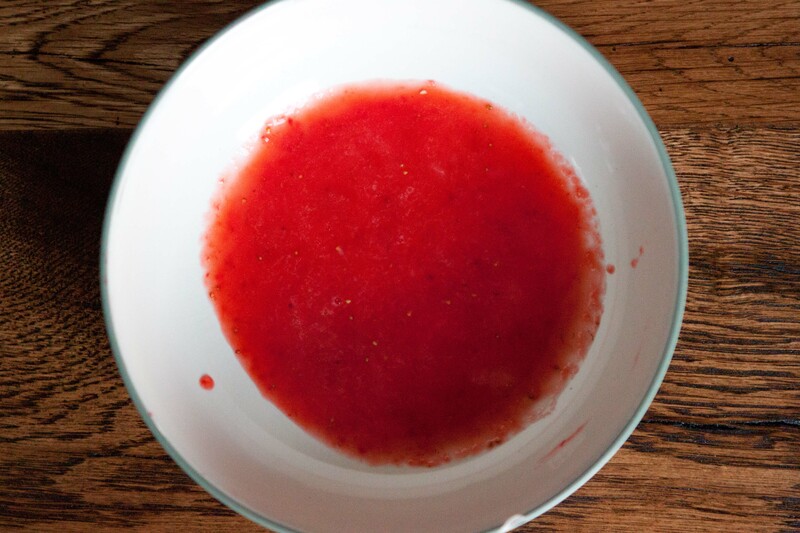 Make a quick simple syrup or honey syrup and add it to the berry puree, then stir in a couple of spoonfuls of good quality apple cider or red wine vinegar. If you possibly can, try to use an organic vinegar, preferably raw. The vinegar is an integral part of the flavor here (I mean, the name is drinking vinegar an all) and a good vinegar has a complexity and muskiness to its flavor, beyond just sour. Once your vinegar base is chilled, mix a generous splash of it with sparkling water (or still water, or perhaps a shot of vodka and some soda, I certainly won’t stop you), and a couple of ice cubes. And don’t forget a lovely garnish (I used fennel fronds). A drink is only as good as its garnish (I don’t think that’s actually true, but it sounded good in the moment). Zing! Zip! Wahoo! If your tastebuds have been lazing about in this heat, this drink will flip them right out of their hammock and wake them up like a spray of water from a cannonball jump into that pool that you really wish was nearby (at least, if you are me). It has all the elements I was looking for, sweet fruit, cold bubbly water, and a kick from the vinegar that just tickles your nose and throat and wakes up all your senses. Summer just got a little bit cooler – that’s the slogan I would use if I were going to bottle and market this stuff. As it is, I am instead going to give you the recipe because, while less lucrative, that’s going to be a much quicker and more effective way of letting you taste it for yourself. And you really should taste it for yourself. 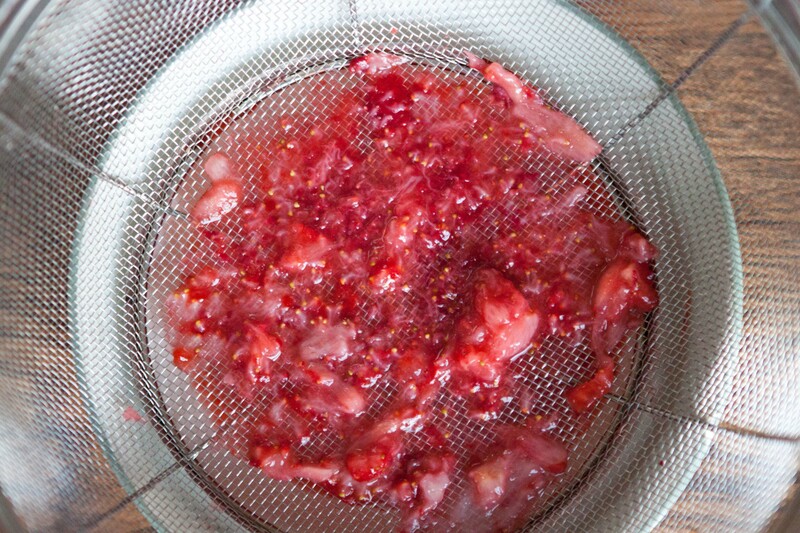 Blend the strawberries into a puree using a blender or food processor. Then, strain them into a bowl, pressing on the solids in the strainer to get all of the smooth puree out. In a small saucepan combine the sugar and water and bring to a boil, stirring until all the sugar dissolves. Simmer on low for 1-2 minutes, then remove from the heat. Allow to cool to room temperature. Stir together the syrup and the strawberry puree. Stir in 1/4 cup of vinegar, taste and add more to taste (I used 2 extra Tbs. because that’s how I roll). Put in a covered container and refrigerate until you want to use it. It will keep for at least a couple of weeks in the fridge. To make a drink, put 1-2 oz. of the fruit-vinegar in a glass, add a couple of ice cubes, then top it off with cold seltzer water. This is all about adjusting the ratios to your own taste. You can make the drink stronger or weaker to suit your mood. You can also use the base for exciting cocktails. 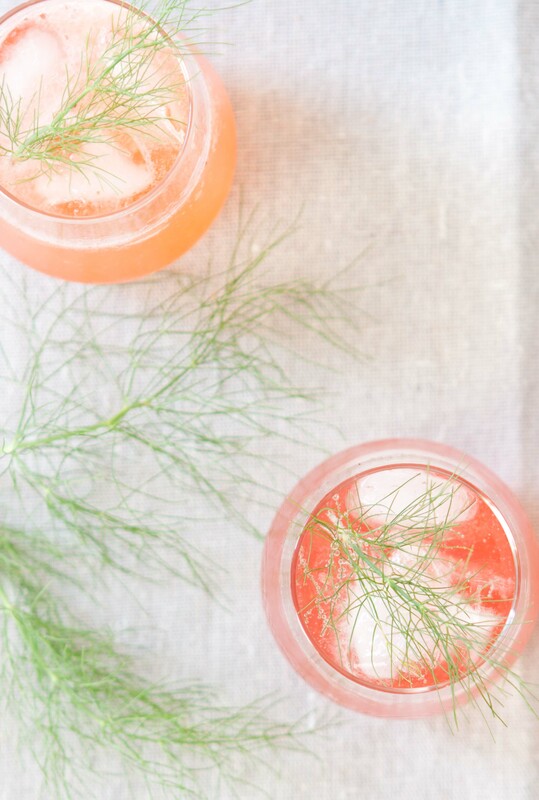 Garnish the drinks with a sprig of herb. Ahhhh. Wow. Great minds think alike. My raspberry shrub is on it’s last day of “standing,” and will thus be made into syrup later in the day. Can’t wait to try it out! Ha, that’s awesome! Enjoy your raspberry shrub. I’m definitely using raspberry next!…Unless I make a peach and ginger one. This sounds just crazy enough to work. i have to say that I’m intrigued! Beautiful photos! Sometimes crazy is just what you need! sounds great and delicious! i also love kombucha, but my mother and i are separated for the summer so vinegar sounds like a great substitute! beautiful photos too. I hope you and your mother are at least writing to each other ;). It’s not quite the same, but it is a tasty alternative! Oh, that’s too bad! I know some people do get a reaction to the cultures in the kombucha. Maybe try the drinking vinegar and see how you like it! Being a kombucha and drinking vinegar virgin, I was not sure what to expect, but decided it was crazy enough to work and I had to try! So I made this with raspberries and honey last night. I don’t think it will last very long – it’s my just-came-home-from-a-swim-waiting-for-dinner drink! Will definately try this with a little gin this weekend – can’t wait! I think that “little boy” who drank the mysterious apple juice in your fridge was actually me! It was certainly a shocker! Haha! Really?! I remember it as Nat! That’s so funny! It’s been really exciting for me to see such a renewed interest in drinking vinegars lately. I got hooked thanks to the housemade drinking vinegar at Pok Pok, and I have been doing some experiments myself. There does seem to be resurgence, and I can see why! I actually do live outside Portland, and whilst moseying around town yesterday w/ a friend, stumbled across a shop that sells AMAZING drinking vinegar. Like kombucha (which I also love!) IT AIN’T CHEAP ($15/bottle). But mix just a touch w/ some soda water–mmm! Anyhow, thanks for the spotlight on it. I gave up drinking booze several years ago & have been looking for a suitable substitute that wasn’t icky-sweet! You are currently reading Strawberry drinking vinegar at Five And Spice.